Persistence of extremist ideologies owes to their laying claim to a single truth. Challenging such claims hinges on the ability to critically evaluate and deconstruct their arguments. Salient features of extremism and the tools necessary to counter them were discussed at the Jinnah Institute University Townh all held at the Department of Strategic Studies at Quaid-e-Azam University in Islamabad. 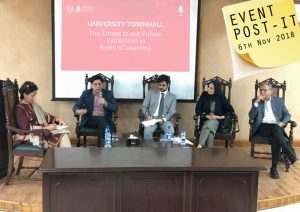 The event themed “Threat to our future: Extremism in Seats of Learning” was attended by students and faculty members. The panelists included Ms. Humaira Masihuddin, lawyer and criminology consultant, Ali Dayan Hassan, senior policy adviser on human rights at UNDP Pakistan and former Pakistan Director of Human Rights Watch, and Dr. A. H. Nayyar, physicist, academic and peace activist. The discussion was moderated by Jinnah Institute’s Salman Zaidi. The discussion began with Dr. Nayyar conceptualizing extremism as a worldwide phenomenon that manifests itself in communities with governance and power vacuums. It propagates the myth of a single worldview attractive to those who conceptualize the world through a linear framework. He recognized that most students in universities are charged with energy, and often anger, fanned by many legitimate grievances. When they do not find recourse with state institutions students also channel their anger in violent activities, most of which are supported by extremist groups. Dr. Nayyar also said that because educational institutes do not encourage critical thinking and reflection, students are susceptible to falling prey to mob mentality rather than interrogating the extremist narrative. He drew attention to the need for identifying fallacious logic when it becomes part of public rhetoric, and the potent effect it has when combined with religious sentiments. Dr. Nayyar underscored the role of educators in inculcating a culture of open inquiry and free thinking among students. Ms. Humaira Masihuddin highlighted that extremists did not always originate from an impoverished or disadvantaged background, contrary to popular belief. Marginalization and social stress produce violence of another kind that does not run along the same continuum of radicalization. The modern day extremist is more likely to have a better socio-economic background, a postgraduate degree, and be a student of science. Ms. Masihuddin discussed the instrumental power of language in paving the way for mass murder, and referred to the pre-war years in Germany and when the propaganda machinery labeled specific communities to dehumanize them. Similar language can be heard in Pakistan today, she observed, when terms like ‘liable to be killed’ and ‘cursed’ have become commonplace. Citing Quranic text and hadith, she underscored that Islamic theology is rooted in rationality and justice, and that the ‘fatwa’ or religious edict is a non-binding legal opinion that does not necessitate compliance. Mr. Ali Dayan Hassan observed that the prevalence of violent extremism in Pakistan is a relatively new phenomenon that can be traced back to 2006 when the first suicide bombing happened in the country. Prior to this, suicide bombing was only heard of in conflict theatres like Palestine and Sri Lanka where the triggers of violence were considerably dissimilar. Despite a modicum of entitlements, rights to full citizenship and opportunities for growth, Pakistan experienced a wave of extremist violence and terrorism carried out by people who were ideologically motivated, he explained. This has a correlation with educational institutions modeling themselves as vocational training institutes producing employable degree holders, rather than as centers of learning that inculcate critical thinking, vision or character in students. He added that student bodies themselves display scant enthusiasm for knowledge, and would much rather obtain degrees than scrutinize their skills, temperament and belief systems. After a lively question and answer session, the event concluded with a vote of thanks to the panelists and Quaid-e-Azam University for providing a platform where students and policy experts could engage on an important theme. 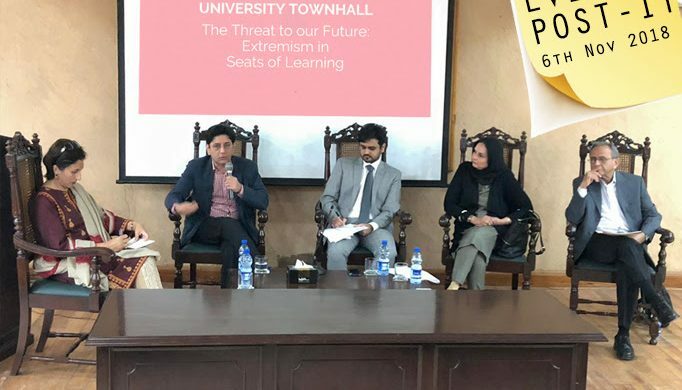 The students were encouraged by a platform where they could openly discuss extremism, its sources and the impact on campus and society in general. This event was part of Jinnah Institute’s Townhall series under the Open Democracy Initiative, which brings Pakistan’s leading experts to interact with youth on issues of policy interest.